ZINGT! A CELEBRATION OF YIDDISH CHORAL MUSIC the brand new CD with mainly never-before-recorded Yiddish choral music, is available! Has it been two months since I hocked you to get a subscription to Jewish Currents? It must be, as the new issue has just come out. My column, the Rootless Cosmopolitan, features a write up of the new album by Dan Kahn and the Painted Bird called "dos tsebrokhene loshn/the broken tongue". Get Jewish Currents (www.jewishcurrents.org) then get Dan's album! You won't regret either purchase. Mr. Grumpy says, "get the braille version of Jewish Currents so you don't have to actually look at it, and definitely consider the Dan Kahn album. I haven't heard it, but Rokhl is the latest in a long line of people who have and who rave about it. Inna Barmash, now in Bucharest on a seekrit mission, writes that if I thought Balkan Beat Box is outasite, I should really lend an ear to Besh o DroM - www.beshodrom.hu. "They've toured everywhere [but the USA], but the logistics are that much harder for US touring. I've been a fan of theirs for years, but only met Gergo, the leader, here in Budapest for the first time a few weeks ago. It turned out that he's Jewish and even made Aliya a few years ago (and came back to Hungary). So there's klezmer/Israeli influence in their music, too... "
"Another news tidbit - I was talking to Kalman Balogh yesterday - the great Hungarian gypsy cymbalom player. He says he's coming to the States in April to tour with Joel Rubin. But he said they're only coming to Virginia... which is a pity. That would be an amazing show... I didn't realize that Joel has collaborated with him before, but this whole gypsy-klezmer scene is closer than ever." More Jewish music reviews in "All About Jazz"
Andy Statman / East Flatbush Blues. Shefa Records, HORN-3001, 2006 www.andystatman.org . CD available from amazon.com . Elliott Simon has also reviewed this CD for All About Jazz. The Klezmershack received two new CDs by Andy Statman, recorded contemporaneously, each featuring a different side of the artist. This is the bluegrass CD, and on it Statman is backed by Jim Whitney, and one of my favorite Americana drummers, Larry Eagle. Eagle I last heard propelling Bruce Springstein's "Pete Seeger Sessions" show. Statman I last saw playing with one of my favorite bluegrass bands, Wayfaring Strangers. But standing there, Statman merged bluegrass with klezmer and hassidic music. On this CD, he pays tribute to Bill Monroe and to his bluegrass roots only. I gotta say: when you're Andy Statman, that's enough. Marilyn Lerner / Romanian Fantasy. ML-001, 2006 www.marilynlerner.com JD003, 2005. I am at the point that if Marilyn Lerner breathes on a piano, I am already giddy. Here, on the first solo outing in a few years based on traditional Eastern European Jewish music, I am doubly ecstatic. Her improvisational playing is as inventive as ever. From the explorations and chording the forms the bones of the "Yismekhu", there is something magical about her sense of sound and tone and music. As Michael Wex notes in the liner notes, this isn't klezmer, or Eastern European Jewish folk music, nor classical nor jazz. It's the Jewish music about which I once wrote, "I can see the Shekhinah sitting up in the heavens, listening to this music performed, smiling to herself and saying to the assembled angels, 'Finally, we can listen to it in its true time and place.'" Balkan Beat Box JDub Records JD003, 2005. I met Merlin Shepherd about ten years ago at KlezKamp. He was an awesome clarinet player then. He has gotten scarily better. On this outing he gathered up a posse of so-far-unknown-to-the-west klezmer players of the former Soviet Union. The ones you find jamming non-stop at the Klezmer festivals and blowing everyone's minds. These guys already knew the repertoire from KlezKamp, so Merlin wrote new stuff. This is the sort of CD I've been waiting for, for years. New klezmer music. But, at this first listen (the CD only arrived today), it's klezmer that manages to sound both traditional, but also as though it were written this year (which it was). This isn't the worshipful, "I can write like the old guys" klezmer. This is the "okay, the old folks stole all our best ideas. let's work on some new ideas" klezmer. Must get the word out now. May have more to say once the CD has sunk in. You can catch some tracks at Merlin's MySpace page. Mizrahi music denied access to Israeli airwaves? It's been over a year since Frank handed me the pre-release CD of this album so I'd have something to keep me awake during an early-morning airport run at KlezKanada. I was immediately blown away by the incredible vocals and insane brass wall-o'-joyous-sound on the opening "In Your Garden Twenty Fecund Fruit Trees" and never looked back. I'm still awake and still tapping my toes. Of all the Frank London projects, the one I love the most unceasingly is the brass band, and so far, each new CD has been mind-blowingly good, and still different from the one preceding. 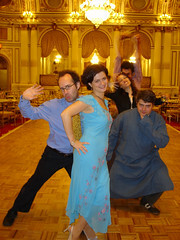 While writing about the KlezKanada Faculty CD a couple of days ago I got that guilty feeling. I had never reviewed this CD on the KlezmerShack. A shande!. A quick shout-out to the Society Hill Synagogue, just south of the Old City in Philadelphia. Over the Thanksgiving holiday, Judy and I were guests at the congregation's "fourth Friday" singing shabbes, and greatly enjoyed it. To paraphrase congregational clarinetist Bob Blacksberg, it felt very good to bring doinas and other klezmer (and hassidic nign, and lots of singing, ranging from modern Debbie Friedmanish tunes to traditional Conservative nusakh. I was down in Philly a couple of years ago to work on the election, and Adobe technical evangelist Leonard Rosenthal showed me around some of the synagogues in the area—it's worth remembering that Philadelphia was the center of American Jewish life until about 150 years or so ago. It's also a nice measure of how the original musical interests that sparked this website have broadened, just a bit, to include actual davenning: traditional and new age and unclassifiable. So, fourth erev shabbat of the month, Society Hill Synagogue, Philadelphia. Tell 'em the KlezmerShack sent you. 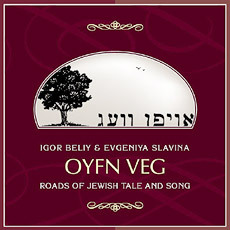 Another path: Inna Barmash on "Oyfn Veg"
Just wanted to share the website for a wonderful new CD "Oyfn Veg" by the Russian-based duo *Igor Beliy* and *Yevgeniya Slavina* - some fresh executions of old chestnuts, some originals, and some more rare numbers. I don't know the performers personally, but I do love their style, and hopefully will see them perform live one day (meanwhile, there are several mp3s on the site under the "Music in Mp3" section. Judith R. Cohen / Sefarad en Diáspora, Pneuma, 2006 PN-780. A new CD from Judith Cohen is always a treat. Her recent albums have been primarily, but never exclusively, Sephardic folk songs. In this latest outing she has assembled a wonderful ensemble featuring Wafir Sheikh and Bill Cooley. Her daughter, Tamar Adams, has also matured vocally, and is a greater delight with every recording. The call response on "Romance Hermanas Reina y Cautiva," accompanied by solitary kanun(?) is wonderful. It's been several years since Rob Tannenbaum ("What I like about Jew") inflicted "Hanukkah with Monica" on an unwilling world with the claim, "there aren't any good Hanukka songs." In the intervening years, we've had Adam Sandler's "Hanukkah Song", and now, for the ultimate in total cultural fun, the LeeVees, featuring Guster's Adam Gardner and Dave Schneider of the Zambonis. By total cultural fun, of course, I mean that this is a CD that rocks, that celebrates Hanukkah, and has absolutely nothing to do with what you may have learned in Hebrew School. Hmm. Nope. This CD has everything to do with what you may have learned in Hebrew School, even if you didn't attend. It doesn't have anything to do with what your parents meant for you to learn in Hebrew school. This album considers the important cultural imperatives, like "Applesauce vs. sour cream" (no-brainer. Applesauce. Sheesh.) or "How do you spell Channukkahh?" with a brief bow to tradition in recounting the dreidl rules: "Nun Gimmel Heh Shin." [Updated from the KlezKanada newsletter, 24 Aug 2006] KlezKanada faculty include not only the most amazing musicians playing traditional music from Yiddish-speaking cultures of the last century. Faculty also include some of the most amazing musicians playing entirely new types of Jewish music grounded in those cultures. Produced by former KK scholarship kid Eric Stein, this CD is a fundraiser for KlezKanada. All faculty contributed tracks free of licensing charges (and got their record companies to do the same). It not only includes the sorts of things one would expect: tracks by Elaine Hoffman Watts, Steven Greenman and the Chicago Klezmer Ensemble, but also tracks that push the edges from David Krakauer's Klezmer Madness with DJ SoCalled, still-unreleased material from Alex Kontorovich's new band, D Minor, a cut off the brand new Susan Hoffman-Watts CD, and a first recording by an amazing new collaboration by Marilyn Lerner and Adrienne Cooper, amazing material from Shtreiml (hint, they aren't "just" a klezmer band any more) and Frank London's Klezmer Brass All-Stars (personal favorites of the KlezmerShack). I haven't even mentioned the revolutionary (a strong word for such traditional-sounding music, until you think of what has just come together and how well it was done) work by the Strauss/Warschauer Duo. Other artists include Khupe, Beyond the Pale, Pete Rushefsky/ Elli Rosenblatt, and Brave Old World—if you haven't heard them and made up your own mind, you know them from the aforementioned KlezmerShack and general media already. CD Review: German Goldenshteyn / A Living Tradition - A+! KlezKanada regular Alan Sissel calls it "the only CD I’m listening to right now." Goldenshteyn is backed by some of the best klezmorim around, from Josh Horowitz to Michael Alpert. The real star, however, is German Goldenshteyn, whose songs and whose clarinet are, as the label says, a Living Tradition. This is traditional klezmer as no one knew it was played any more until German arrived in the US and demonstrated the music that he had been playing all of his life. a bisl of the music that formed his living tradition is now passed on to us. I can confirm that the group is Thai—apparently a popular Thai comedy troupe. And then serendipity struck. Tonight, we were watching a rather pleasant "B" movie—"Keeping up the with Steins". Needless to say, this film features two versions of Hava Nagila. One features DJ Quik; the other Neil Diamond. Both are, um, memorable. At my wedding, we asked the band not to play Hava Nagila whatever the provocation, a request with which they happily complied. It isn't even Thanksgiving yet and I'm already in a panic about how few reviews I've written and how much I want to be sure that the people who make the music I love get the word out in time for the holiday. So, I'm going to do my best to mention at least one recording each time I sit down at night to work on school or do some programming between now and Hanukkah-ish. I could begin this series in many, many places, but there is only one new Jewish music DVD. There are movies about klezmer, or other Jewish music, or even about the downtown radical Jewish music scene, but no concert movies of great (or even mediocre) bands until now. And it couldn't be more appropriate than this: Brave Old World, nor could it sound much sweeter—this is a monster concert, featuring much of the music from their "Royte Pomerantsn" and "Bless the Fire" CDs, in front of a friendly audience (Montreal, at a fundraiser for KlezKanada), with the band as tight as one can imagine, playing as if their very playing would bring the Messiah here and now. Indeed, after watching the DVD, one wonders how the Messiah is able to stay up in the heavens rather than come join us already. When I watch Brave Old World in concert—in real life, and here, as well, I am always struck by how intense their playing is. Sometimes I hark back to myself as a teenager watching King Crimson thinking, "wow, I really don't get this music, but these guys are wonderful." Except that I do get this music, and thought it wonderful even before seeing the extra dimension of watching them play. Some pieces that never turned me on, on record, like the Itzik Manger poetry recited in "Der mentsh trakht un lakht" and reset on "Yankl Dudl" make perfect, ethereal sense here, live (oh, for joy, watch Stu's fingers with the tsimbl hammers while the band plays "Yankl Dudl"). Then, listening to Michael introducing the band before breaking into "Royte Pomarantsn," one of my favorite all-time songs here performed with the zest and life that it demands, I smile so happy. Where can I purchase this gem, you ask? Once again the band eschews the practice of putting the music where the people are. Fuhgedabout amazon or your local Judaica store. But, that's okay, this is the internet. Your browser can take you anywhere. In this case, visit videographer David Kaufman's website (he that produced this masterpiece), www.sunstreetproductions.com. Tell 'em I sent you. Order a dozen. They're cheaper that way, and with a DVD this compelling, you can easily give out that many over the holidays. P.S. Did I mention that you can play this puppy on your PC so that you can have it right there while you're working like I'm doing now? Go ahead, order another one for the computer station: www.sunstreetproductions.com. Mark Rubin's klezmer band, Rubinchik's Orkestyr, has released only one CD, back in 1998. Rubin is more often seen teaching at venues such as KlezKamp, or performing with the Youngers of Zion. But, for folks looking for the Texas swing in Klezmer, this is the real thing. Praise the Lord, it has now been re-released and is available on iTunes. Should you lack a copy, I must humbly and forcefully suggest that it is time to purchase a copy. Go to iTunes and look under "World" music. She was a child of survivors and sang songs from the Holocaust. She sang Kol Nidre for the Aquarian Minyan for many years. She was featured in the Jewish Music Festival numerous times.